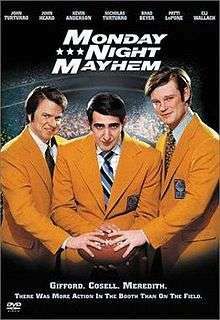 Monday Night Mayhem is a 2002 television film about the origin of ABC's television series Monday Night Football. It debuted on the U.S. cable TV network TNT. It was based on the 1988 book of the same title by Marc Gunther and Bill Carter. In the same year, Jon Voight portrayed Howard Cosell in the Michael Mann biopic Ali (2002). Voight's performance earned him an Academy Award nomination. The movie was released on DVD on September 10, 2002.